Recently, we have launched Import History (May 9th, 2018), which gives you a comprehensive timeline of uploads to your folder. Within the Import History it is easy to identify duplicates. At the same time, there is the "old duplicate filter" still cluttering your folder. A file duplicate is a copy of the file that has been previously uploaded to your folder. As a rule, you wouldn't want to process such file, but delete it. On June 8th, 2018 - we will move the old duplicates to the trash. On July 9th, 2018 - we will permanently delete the old duplicates from your folders and from our systems. Please note, the files are duplicate copies of files that were previously uploaded to your folder. After June 8th, we will also start automatically deleting duplicate files from the new duplicate filter after 45 days. 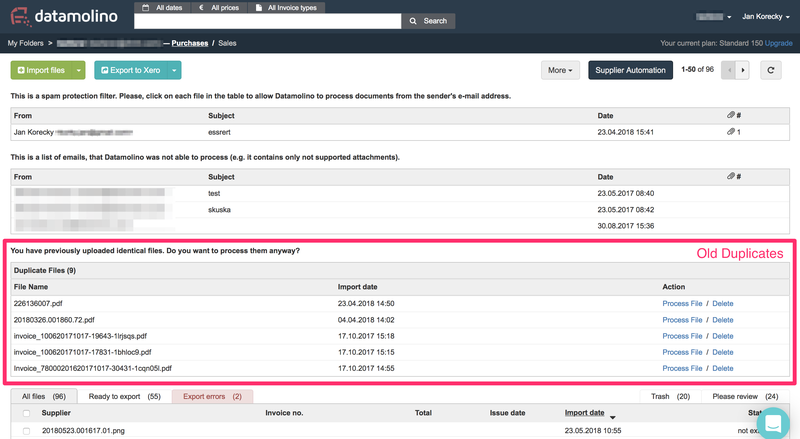 Before we have launched Import History, your duplicate files have been shown above your processed documents. This view has shown you the last 5 five duplicates. The deleting of the duplicates was a bit tedious, so most users just kept the duplicates. This resulted in clutter within the folder. NOTE: Old file duplicates will be PERMANENTLY DELETED after July 9th, 2018. In the Import History, it is easy to see if the system has identified file duplicates. NOTE: The system will permanently delete duplicates after 45 days if the user does not click on "Process anyway" during this period. If you have any questions about this, please contact our support team through the chat interface.